- city girl diaries -: 1st Ever Movie Premiere! 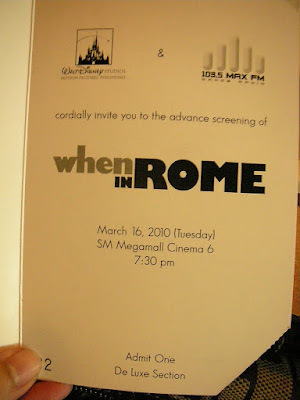 We got free invites to the advance screening of "When in Rome" from its sponsor, MaxFM. I dunno how the tickets landed to my friend's hands. 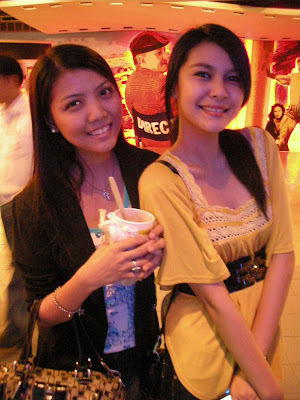 But thanks to him 'coz we were able to see this movie for free haha! Story line's a bit shallow, but it's fine 'coz it never had a dull moment. It was so hilarious! I really enjoyed watching it. I was laughing about 90% of the movie haha! 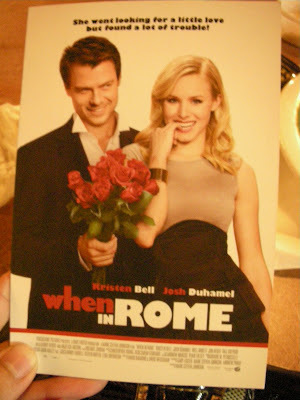 Conclusion: I wanna get married in Rome too!!! hahaha!=)) One more thing, real love happens...but at the least expected time, at the most unexpected way. Once you've found real love, that's when the magic happens! OMG...am I becoming sooo cheeeeesy??? hahaha!